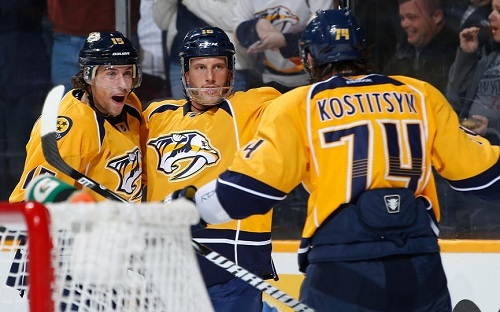 The Nashville Predators have been on a downward skid recently. Not only did they drop three of their four games between February 23rd and March 2nd, but they’ve dropped down to fourth in their division and ninth in the Western Conference after holding a steady place in fourth or fifth. Offense continues to lack and fans are beginning to wonder if the Predators will ever find their stride. Nashville fell 4-0 when visiting the Detroit Red Wings on February 23rd. The win was great for Detroit, who before that game hadn’t won in 13 days. The shutout win further proved just how much Nashville has been struggling to capitalize on scoring chances. Drew Miller caught a rebound in front of Pekka Rinne and scored 5:11 into the first period. Tomas Tatar then wrangled a loose puck and lifted it up and over Rinne at 2:58 into the second period. At 15:33 of the second, Daniel Cleary scrummed with Predators’ defenseman Scott Hannan, obstructing the view of Rinne. Niklas Kronwall sent a one-timer towards the net and the puck skidded into the net. Cleary notched Detroit’s final goal of the game on a late power play in the third period. The Predators had won seven of their last eight games against Detroit stemming from last year’s first-round playoff series where they beat the Wings four games to one. Predators’ rookie defenseman, Roman Josi, had an outstanding night against the Dallas Stars February 25th. The young d-man tallied two goals and two assists as the Predators rose above the Stars 5-4. Josi has only one other multi-point game in his career and it had come exactly one year before when he tallied two assists in a game against the San Jose Sharks on February 25th, 2012. Craig Smith got Nashville on the board with 13:43 of the first period, ending Nashville’s scoreless streak at 133:43. Dallas’s Matt Fraser and Reilly Smith scored 25 seconds apart within the first two minutes of the second period, putting a damper on the Preds. Fraser netted his first NHL goal with a slapshot from the left circle at 1:20, then Smith popped the puck of Pekka Rinne’s left leg pad at 1:45, giving the Stars a 2-1 lead. The Predators responded quickly as Roman Josi tied it at 2 after taking a slapshot from the blueline at 3:05 of the second period. Preds’ Martin Erat was then called for holding and as his team tried to kill off the penalty, the Stars drew another penalty from a high-sticking by Mike Fisher. Vernon Fiddler came onto the ice as an extra attacker and scored at 7:29, giving the Stars a 3-2 lead. With Fisher’s penalty being a double-minor, the Stars’ continued with a 5-4 man advantage and Loui Erikkson made it 4-2 with a shot that was redirected into the net by Nashville’s Josi. Craig Smith #15 celebrates his goal with Rich Clune #16 and Sergei Kostitsyn #74 of the Nashville Predators against the Dallas Stars during an NHL game at the Bridgestone Arena on February 25, 2013 in Nashville, Tennessee. Dallas’ Eric Nystrom was called for fighting and unsportsmanlike conduct, and the Predators received 1:21 of a 5-on-3. Fiddler was then assessed a double-minor for unsportsmanlike conduct and roughing. With two seconds remaining of the powerplay, Patric Hornqvist sent a backhander over Cristopher Nilstorp at 13:43, pulling the Preds to within one goal. Mike Fisher tied it for Nashville at 8:22 of the third. After acquiring the puck as he skated into the Predators’ zone, he split through two Stars and backhanded the puck past Nilstorp on a semi-breakaway. Roman Josi scored the game-winner 28 seconds into overtime, giving Nashville their first win in six days. Nashville gave the Anaheim Ducks their seventh straight home victory, along with Kyle Palmieri getting his first NHL hat trick in a 5-1 loss. The first goal came as Anaheim dumped the puck into Nashville’s zone. Rinne went behind the net to play it, mishandled it, and lost the puck to Ducks’ rookie Emerson Etem, who sent a pass in front of the empty net to Nick Bonino who scored his fifth of the season. Palmieri scored for the Ducks 61 seconds later off a 2-on-2 rush with Corey Perry. Perry sent Palmieri a pass in the left circle, who then got around Shea Weber, cut in front of the crease, and jabbed the puck past Rinne’s outstretched left leg. The Predators didn’t get their first shot on goal until 6:11 of the first period. Palmieri got his second goal at 16:57 of the first, catching another pass from Perry from behind the net of Rinne after Ryan Getzlaf won a faceoff in Nashville’s zone. Palmieri’s hat trick came during a power play for the Ducks. The Predators were called for too many men with 36 seconds remaining in the first, so the Ducks started the second period with the man advantage. Palmieri tipped the puck in past Rinne at 1:07 into the period and the hats came flying. All three of Palmieri’s goals had primary assists from Corey Perry and secondary assists from Ryan Getzlaf. Craig Smith scored Nashville’s lone goal at 9:27 of the second. Anaheim converted once more on the power play as Saku Koivu tipped the puck in with 40 seconds remaining in the second period. Pekka Rinne gave up five goals on 21 shots before he was replaced by Chris Mason to begin the third period. His game against Anaheim was also his third consecutive game where he’s allowed four or more goals. He came in having a 1.90 goals-allowed average and league-best three shutouts. “We didn’t put pressure on the other team at all. We made it easy for them. We have to get back to work and try to sort this thing out,” Craig Smith added.